APF_Holder has been specifically designed to hold an APF6_Dev, APF51_Dev, APF28_Dev or an APF27_Dev development board with a ST0700_Adapt or LW700AT_Adapt screen. 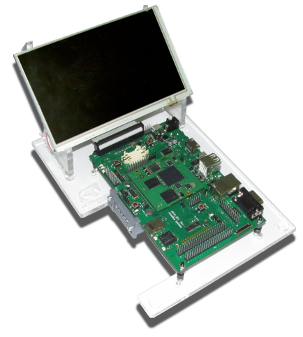 This kit is made up of a plate for the development board and of two clips to hold a Armadeus 7" screen at a 45-degree angle. Required screws and assembly instructions are also provided.